Jon Hallman (Stumptown Underground) and hopskotch SunDAY (Have At Thee!!) collaborate on this versatile collection of short stories, written and illustrated in thirty minutes, respectively. The story plots range from surreal to conversational to smutty, and the illustrations are some of hopskotch’s best. It’s amazing what can be created in a half hour, and inspires the reader to think about what she can accomplish in the same amount of time. “Yes.” replied Melba and hopped away. Maybe I have become a nerdy fan of Tom's but the comics rule in this issue. Tom shares in detail his dream girl and what they would do together, a conversation with Artnoose, hairy muffins, bike spandex in bed, his dad's adventurous doctor visit and a few other stories. This BEST OF issue is packed full of the BEST comics and nonfiction stories from the deep, depths of all twelve issues of Zombie Soy Bot! It is an awesome collection of the author’s funny adventures in music, traveling, friendships, skateboarding, eating way too many bananas, attempting to try out “party week” and lots more. Don’t worry its not all satire and humor, it is sprinkled with life affirming reflections and thoughts on living happily. Bigfoot could really use a vacation from the woods. He decides to walk into his local travel agency to help him plan a relaxing and luxurious trip to Hawaii. It’s all good times until a face-off with the angry volcano God. Read to find out whether or not he can put his big foot down to save the day...also, isn't it strange Bigfoot never wears pants? I wish my scanner would have picked up the delicious hot pink color that this zine actually is printed on! 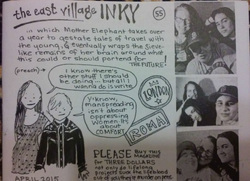 The tale in this zine is so cringeworthy and good! It's a twist on The Little Mermaid. This mini is packed with revenge, cruelty, and sadness. He owed her his life. Oh, K8! You've got a hold on me with these mini stories. Sleeping Beauty is the feature of this tale and, oh, she doesn't want to be. Poor girl just wants some rest, but instead, she wanders wearily in an unforgiving world. Blessed with the temperament of an angel, she utters not a word of complaint, even taking the hateful children into her arms and rocking them to sleep. "You must be kinder to the children," the prince says over and over again. HAT!! #2 is a profound musing on dealing with other people and their emotions, as well as our own, on a daily basis. hopskotch writes early on, “Meaning is created. If we are going to create meaning, why not create a positive meaning?” A nice affirmation of it being okay to be frustrated with other people sometimes, and to take whatever life throws you in stride. This issue of HAT!! covers what it takes to be happy, regardless of material possessions or external situations. With exquisite micro-illustrations and a motivational theme, HAT!! #3 is a great addition to this series of pocket-sized pick-me-ups. There is so much to enjoy in this zine. The layout is beautiful, the detail knots in the binding, and the whimsical stories written by Rita. May Baskets and Spring Flowers, Stories to be Carried, The Spider and A Conversation With The Moon are all lovely tales around nature, nostalgia & getting lost in imagination. This zine also contains a bonus mini called Reading to the Faeries. Kris says, "A heart-warming(ish) Christmas story about family. And how even Santa can't escape carnivorous appetites." Sage says, "Little Lost Yeti is incredibly cute and loves to play with animal friends. Santa comes to Little Lost Yeti's rescue and is rewarded in an unfortuante way." 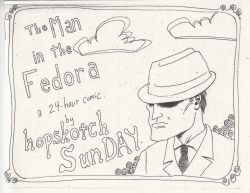 The inspiration for this comic stems from hopskotch's experience with an abusive step-dad. It's the story of a family, the dad is an abuser and the son attempts to protect his mother. Then, the man in the fedora appears to save the mom & kids! The man allows the mom to go back in time to her younger self. I don't want to spoil anything, so I'll stop there. It's a great comic with an equally great message. 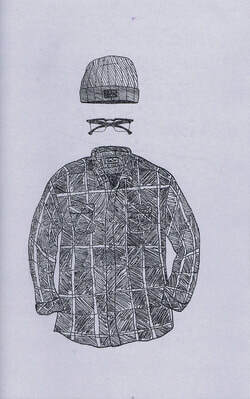 Bradley makes drawings during his AA meetings and decided to combine some of these doodles and mini masterpieces into a zine for all to enjoy. Created in various meetings along the west coast from Los Angeles to Portland to Olympia - No. 2 is full of graffiti art, explosives, funky faces, and more. Fighting inner demons with ink ... it's all here. Ah, political satire. Just what I needed to read while trying to stay afloat in this political circus America calls the presidential election. 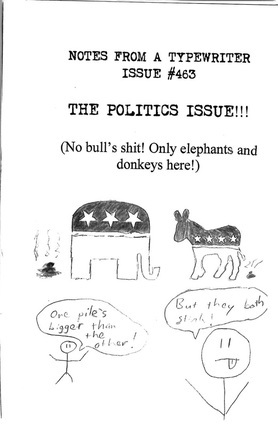 This flash fiction zine contains the following pieces "How I Won the Iowa Caucus" and "The Torture Chamber." My personal favorite was "How I Won ...," we have a political candidate who prides himself in leaving dumps and such on the doorsteps of Iowa's residents and the wild press coverage he receives. TIP: This is an adult read, sorry kiddies. Stab Yourself is all about stick and poke tattoos - a satire ... or is it? That's for you to decide. With a step-by-step guide on marking yourself with ink and 20 small designs that are hip (coffee cup, art tools, lettering, etc) - it's a fun art zine to enjoy and share with your friends. Make good choices with the info, m'kay?